New York Times bestseller | Member of Oprah's SuperSoul 100 | one of World Economic Forum's "Most Recommended Books of 2016"
Now in paperback, the harrowing,* inspiring**, and unforgettable† memoir of redemption and second chances amidst America's mass incarceration epidemic. Shaka Senghor was raised in a middle class neighborhood on Detroit’s east side during the height of the 1980s crack epidemic. An honor roll student and a natural leader, he dreamed of becoming a doctor—but at age 11, his parents' marriage began to unravel, and the beatings from his mother worsened, sending him on a downward spiral that saw him run away from home, turn to drug dealing to survive, and end up in prison for murder at the age of 19, fuming with anger and despair. Writing My Wrongs is the story of what came next. During his nineteen-year incarceration, seven of which were spent in solitary confinement, Senghor discovered literature, meditation, self-examination, and the kindness of others—tools he used to confront the demons of his past, forgive the people who hurt him, and begin atoning for the wrongs he had committed. Upon his release at age thirty-eight, Senghor became an activist and mentor to young men and women facing circumstances like his. His work in the community and the courage to share his story led him to fellowships at the MIT Media Lab and the Kellogg Foundation, membership in Oprah Winfrey's SuperSoul 100, and invitations to speak at events like TED and the Aspen Ideas Festival. SHAKA SENGHOR, a member of Oprah's SuperSoul 100, is a writer, mentor, and motivational speaker whose story of redemption has inspired thousands. 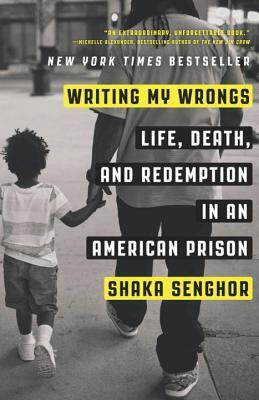 While serving 19 years in prison, Senghor discovered redemption and responsibility through literature, his own writing, and the kindness of others. He is the author of six books, a former Director’s Fellow at the MIT Media Lab, a Community Leadership Fellow with the Kellogg Foundation, and the founder of The Atonement Project, which helps victims and violent offenders heal through the power of the arts. He currently serves as the Director of Strategy and Innovation with #cut50, a bipartisan initiative to safely and smartly reduce the U.S. prison population in half by 2025, and speaks regularly at high schools, prisons, churches, and universities around the country.